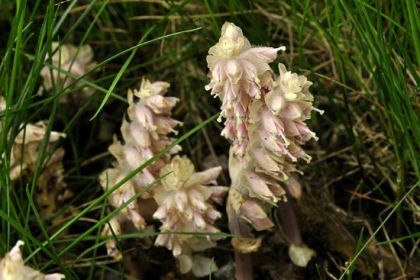 Toothwort is not easily confused with other wild plants on this web site. This is a strange, unmistakeable wildflower which survives by being parasitical on the roots of Hazel, Wych Elm, Alder and other trees. Containing no chlorophyll, it grows in shady, moist, woodland habitats obtaining all its nutritional needs from the trees or shrubs. It's an erect little plant with white, downy stems and tubular flowers (15-20 mm) which are arranged in one-sided spikes up to about 25 cm high. The two-lipped corolla is pale creamy-pink and is longer than the four-lobed calyx. Little white, clasping scales serve as leaves. This native wildflower is quite hard to find, it blooms in April and May and belongs to the Orobanchaceae family. I first recorded this wildflower near Lullymore, Co Kildare in April 2010 when I also photographed it. First recorded in Ireland in 1727 by Caleb Threlkeld who wrote: 'Found upon a moist Acclivity as we came up the Sea Shore from Dunlary to Newton', referring I would suggest, to the stretch of coastline between Dún Laoghaire and Newtownsmith, as they are now known. 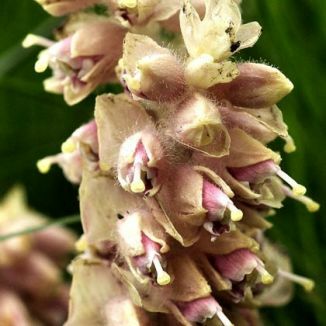 In his Flora of the County Dublin of 1904, Nathaniel Colgan described this plant as 'rare'.